Whether you decide to travel to Australia, Asia, Europe, the Middle East, South Africa, or California, you can stay somewhere that offers a bird’s eye view of beautiful scenery and seascapes. 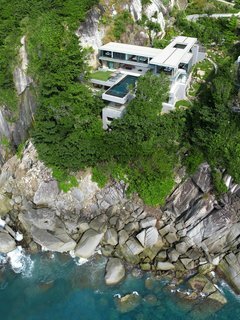 Here are some incredible modern cliffside properties we found. 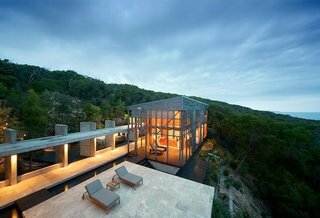 Nestled amidst Australian bushland and set high above the Pacific Ocean, this house by award-winning Australian architect James Grose of Bligh Voller Nield was built with minimal impact on its natural environment. 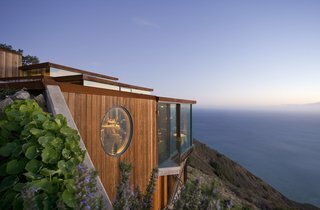 This resort offers a collection of different accommodations, including a Cliff House that hangs over the edge of a cliff while looking out to views of the sea. 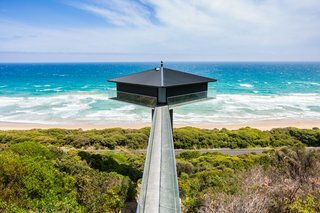 Rumored to be one of the most photographed homes on the Great Ocean Road, this house is suspended 131 feet above Fairhaven Beach. Designed by F2 Architecture, the house balances atop a concrete platform supported by a 42-foot-high plylon and is accessible via a narrow bridge. 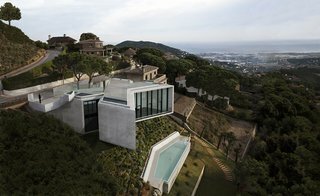 Located just outside of Barcelona and sited on a steep hill overlooking a valley and the Mediterranean Sea, X-House by Spanish architectural studio Cadaval & Sola-Morales has bold, fully-glazed angled frontages that look out to stunning views of the surrounding landscape. 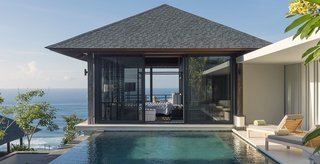 Designed by Asia-based practice Original Vision, this villa located on Cape Sol in Kamala Kathu, Phuket, is a stunning and spacious contemporary residence that inspires total relaxation. 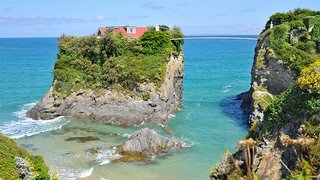 The only home perched on top of an enormous rock rising out from the sea, The Island, which can only be reached via a private suspension bridge, is a great way to ensure a peaceful and secluded holiday retreat. Perched atop a cliff, Villa Hamsa is a four-bedroom, fully staffed villa in the southernmost section of Bali’s Bukit Peninsula. It has generous dining spaces, a large infinity pool, and its own gym and massage room. 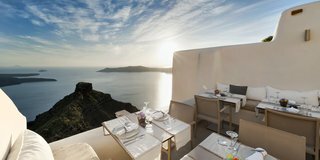 At this modern Cycladic boutique hotel in the village of Imerovigli, you can enjoy breathtaking views of Santorini’s majestic caldera from the pool, your bedroom, or the resort’s fine dining restaurant. Perched high on a ridgeline more than 6,500 feet above sea level in the Al Hahar Mountains, this resort, which was opened in 2016, is a rustic yet contemporary retreat that puts you in the midst of Oman’s stunning natural landscape. Looking out to unobstructed views of the Atlantic Ocean and Cape Town’s rugged coastline, this clifftop resort has multi-room suites, as well as modern and elegantly furnished apartments that open to lovely views of the sea and the suburb of Clifton.